What can I say… we have bright candles… I mean stadium lights… on our cakes! 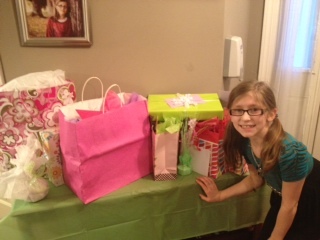 Please join me in wishing a VERY special, now-9-year-old little girl a VERY happy birthday!!! My sweet little girl is SO incredibly special. The day she was born I felt like God was smiling down on me, telling me he had something oh-so-special in mind for my Lacy. You see, just a little over a year before, I’d miscarried a little baby. We named her Abigail. But had Abigail been born… Lacy would never have been. My Lacy has a BIG heart, she loves to love on people (although she loves to pick on her little sister too… but that’s normal right?!?) and loves to play softball. She is a beautiful little girl inside and out!! Yup, my Lacy is SUPER special! I thank Jesus for her ever single day!!! Happy Birthday Lacy! I hope you have a very special day! 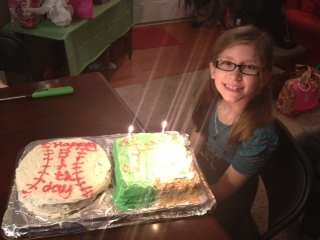 Happy 9th Birthday, Lacy! You are special! I pray God will bless you on your birthday and always! Thank you everyone for the kind birthday wishes for my little girl!!! Happy 9th birthday Lacy! May God bless you with many more! A belated birthday wish to your dear Lacy.